How many children will join our family until we will feel our family is complete? After two biological boys and two daughters adopted from Korea , I am still unsure of the answer. Many people in today's society are moving towards smaller families and we seem to be moving against the crowd. I never cared much for going with the flow. After giving birth to two wonderful and rambunctious boys, each as different as night and day, my husband and I still wanted a daughter. 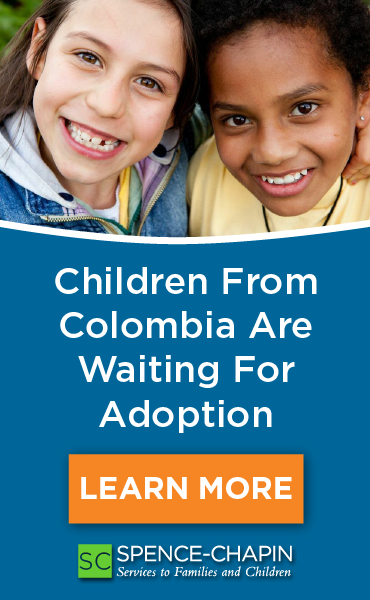 Even as a little girl, I always knew that adoption would be integral to creating my family. My sister was adopted domestically and I saw first hand that blood is not always thicker than water. For many reasons, we chose that adoption would be the way our daughter came into our home. After entering the Korean program with Holt International, my heart went out to a waiting child listed on their website. Ah Jin (which means Pretty Treasure in Korean) was 3 months old and had contracted bacterial meningitis as a week old infant. She also was born with a congenital heart defect, a ventricular septal defect (a hole in her heart). After looking at her medical records and talking to a doctor, we decided with two young boys at home, we were unable to take on the unknowns caused by her illness. We continued to wait for our referral, though I often would check the Holt website to see if little Ah Jin was still waiting for a family. What we did not know was that Ah Jin was already our daughter; we just did not know it yet. Five months after seeing her for the first time on the website, the waiting child coordinator gave me a call saying that she had recently seen a beautiful little girl with a heart defect and believed we would be her perfect forever family. The moment she started to describe this girl, I knew it was Ah Jin she spoke of. Fate is funny sometimes. Audrey Rhiannon AhJin came home just over two months later on her 10 month birthday. After a bit of adjusting, Audrey settled into the family like she was always there, and maybe she was. Her eldest brother, Connor, liked to help out and give her bottles, patting her on the back to help her calm down. Her other brother, Rhys, was only 8.5 months older than Audrey. His attitude has always been to just go with the flow and having a sister has not changed him. Audrey had a few therapists come out from the Early Childhood Intervention program and after 6 months she was caught up. She has shown no side effects from the bacterial meningitis but we understand that there are still unknowns. Her pediatric cardiologist does not believe her VSD will require surgery even though it has not closed on its own yet. She was a typical, happy girl who wants to be a princess. We began to realize that her social worker knew something when she named her Pretty Treasure. She is definitely going to grow up to be a beautiful girl. At this point, most people thought that having three children under the age of 4 was pretty crazy. We had just moved to a new state and bought a new house. Our family was now half a country away. So why was I thinking that Audrey needed a sister and our family needed another daughter? While we were in the middle of adopting Audrey, I had heard wonderful things about Peg and Jill in the waiting child program at Children's Home Society of Minnesota. Now that we had moved to North Carolina , our options for agencies were more limited should we decide to adopt again. One of those agencies was CHSFS. I knew the agency posted waiting children on the Rainbowkids website ( www.rainbowkids.com ). After a few weeks, my heart was drawn to a new little girl posted on the website. She had the cutest little smirk. She had a somewhat serious congenital heart defect known as Tetralogy of Fallot. I began to look up information on TOF and while at one time these blue babies rarely survived for long, medical advances have given TOF babies pretty much a normal life. I talked to my husband about this little girl and it did not take long for him to realize that he had another daughter waiting for him in Korea . After we reviewed her medical file and talked with Audrey's pediatric cardiologist, we spoke with Peg and informed her we wanted to start the process in bringing our daughter home. Until I spoke more with Peg, we had planned on having Sun Ryung escorted. Peg convinced us that having at least one of us travel would be better for our daughter. Sun Ryung had been in the hospital and nurse care for her the first year of life and having one less transition period would help. There was the possibility that she may have some attachment issues, so we were willing to do anything that might make the transition easier for her. Two months after we sent off our acceptance papers, I answered the phone at 7:30 a.m. knowing it could only be one thing. 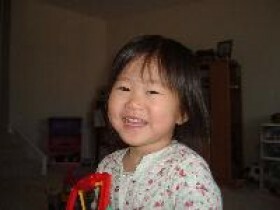 Two days later I was headed to Korea to pick up our daughter, Melody Margaret SunRyung. My husband stayed at home to take care of our other children. Melody has shown no attachment problems and has almost seamlessly blended into our family. Her nights and days were switched by the time I arrived in North Carolina . She slept through the night after two days. She loves to eat anything and everything and enjoys having two brothers and a sister. Connor appears to have taken a special interest in Melody and plays the big brother role well. We are going to enjoy watching their bond grow. We probably have had more difficulty with Audrey adjusting. She did not care to lose her spot as the baby. Combined with the terrible twos, she has been a bit of a handful. She has now relaxed a bit more and has realized that now she has a sister to play with. That comes in handy now that her brothers often have boys only playtime in their room. Melody's heart is still fragile. At around two weeks old, she had a modified BT shunt inserted. She had open-heart surgery to fully repair her heart before we even saw her on the website. They inserted a conduit during her surgery that will require replacement when she gets older because the conduit does not grow with her. Her pediatric cardiologist cannot give us an idea of when she will need it replaced, only that she will. She runs, plays and laughs like any other little girl, though. Unless you saw her chest scar, you would not know that she the difference. Knowing Melody will require at least one more surgery scares me, a lot. It makes me hug her a bit more at night and keep my eye on her when she gets a cold. That is what mothers do, though. We worry. My worry does not stop with Melody. I worry about all my children in one way or another. We chose the waiting child route because our daughters happened to need a little bit of extra medical care. Our sons are biological and one has a language difficulty and the other has a bowel disorder. There are no guarantees with children. The mystery helps make them special.